Walk into bright white interiors with some of the most quirky quotes on the wall and settle into your nail session with a cup of awesome coffee. Galleria Market’s Strike A Pose now gets you spiffy from head to toe, literally! So, there are basically two types of nail extensions: Acrylic and gel. Both involve artificial extensions and the process essentially takes about the same time but there is one critical detail that makes all the difference. With acrylic, a powder based ‘product’ is applied with the aid of a liquid chemical to set the extension on the natural nail. 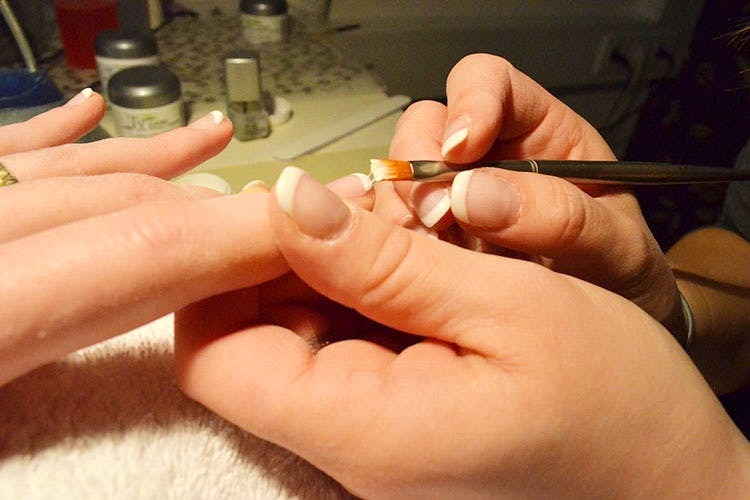 With gel nails, the ‘product’ is a gel base. The acrylic powder tends to bulk up the nail extensions and is less natural looking while the gel sets very naturally. Strike A Pose has launched their gel nail service at the Galleria outlet with a set up that’s both quick and neat. So, if you need a refill or have been contemplating nail extensions, this is the place to hit up! When you indulge in a makeover, don’t forget your nails. Get a new set of gel nails with a chic French manicure or be adventurous and go in for cool nail art, whatever you choose, there’s no doubt that gel nails look super good!